Of Steps and Staircases . . .
Steps. "Steps? Ho-hum— simple and utilitarian." If that's your reaction, hold on! Steps are anything but simple and, besides being utilitarian, they can lend dimension or charm to your house. All too often steps are uneven or creaky or cracked. The don't look good, they don't feel good, and they could be a safety hazard. 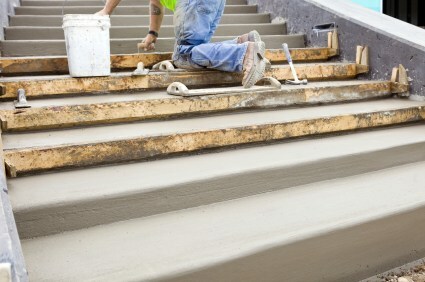 We at AAP Construction are the right persons to repair your steps – or construct a new flight of steps for you. In business since 1993, we have repaired and constructed countless steps and staircases. Anything more than three or four steps also needs a banister or railing. Banisters and railings, made of various materials from iron to fancy woods, are a specialty for AAP Construction and are priced to suit every pocket. We make it possible for you to add that pretty, personal touch to your steps. Sometimes even single-level apartments have steps. These are split-level apartments. Indeed, steps are specially important in these. A sharp edge could cause a cut ankle. An indistinct step that blends into the flooring could cause a guest to fall. Concrete steps can be made attractive with an impressed pattern, steps can have a mosaic effect, they can even be made of marble. As experts in the business, AAP Construction will guide you with your options with the final choice being entirely yours. With AAP Construction you're not taking any chances. We do it all from constructing a modest three-step entrance to your porch to designing and building a marble-stepped and teak-balustraded 100-step stairway of sweeping magnificence!